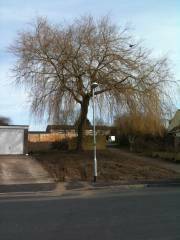 Site Clearance (Day 3) - The final remaining thing cleared from the site, is the willow tree in the front. Site Clearance (Day 2) - The plot looks completely different when I arrive on the morning of the 2nd day. Site Clearance (Day 1) - An exciting landmark day, as the first physical action starts on-site to clear the overgrown greenery.